Yield of drought affected fields is usually reduced. But buyers and sellers of corn silage often ask, “How does drought affect corn silage quality?” Sellers look at drought affected corn and either are disappointed and just try to get what they can for the field, or give up, plow it down, and start planning for next year. Buyers look at a drought affected corn field and wonder how well cattle can produce milk or beef from the silage and what additional feed supplements will be necessary for the feed ration. Two environments (Arlington-2005 and Marshfield-2006) had drought stress prior to pollination, followed by timely rains during pollination and grain-fill. Plants in these environments were short (i.e. < 6 feet tall), but had average to above average grain yield for the location. Forage yield tended to be reduced slightly in these drought affected environments compared to normal environments. 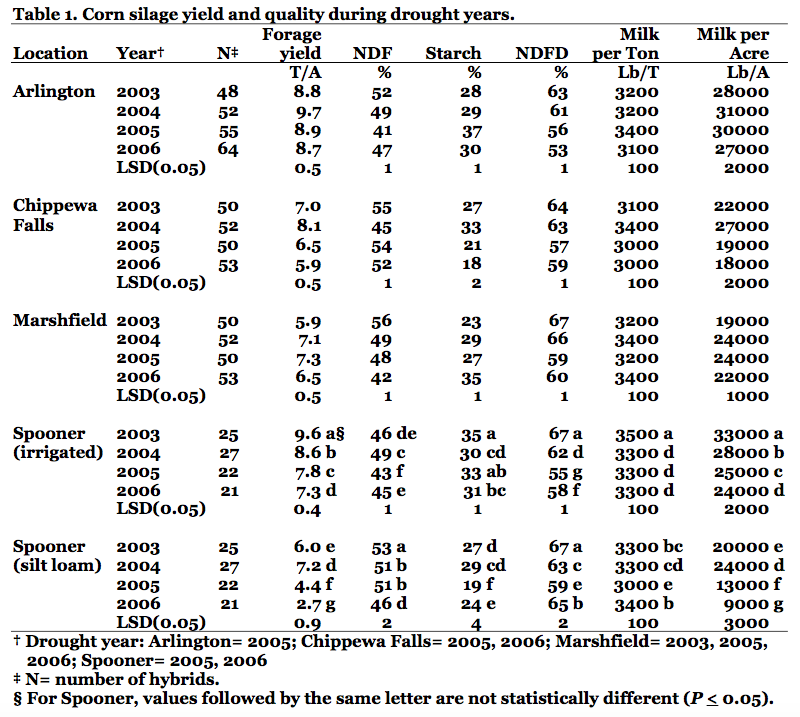 For example at Arlington during 2005, forage yield of 55 hybrids was 8.9 T/A while 2003, 2004, and 2006 forage yield averaged 9.1 T/A (Table 1, below). NDF content was lower and starch content was greater resulting in higher than average Milk per Ton. Corn plants were shorter but had a greater proportion of grain in the silage. Thus, quality as measured by Milk per Ton was not affected, and yield as measured by Milk per Acre and forage yield was similar to other environments. Environments that had drought stress extending into grain filling were Chippewa Falls-2005,2006, Marshfield-2003, 2005, and Spooner-2005, 2006. At Spooner the same hybrids were planted on a dry land silt loam site and under a site with center pivot irrigation. We will consider the Marshfield environments separately. At Marshfield, growing season environments from April 1st to August 15th during 2003-2006 have been extreme for temperature or precipitation. During 2003, the growing season was both cooler and drier than normal. During 2004, precipitation was normal, but it was the coolest of the previous 30 years. During 2005 and 2006, temperature was normal, but precipitation was lower than normal; although 2006 ended with average grain yield. Even though environments fluctuate widely, Milk per Ton is relatively stable at Marshfield varying only about 6%. Environments where drought stress occurs prior to pollination and is followed by rainfall during pollination and grain filling, produced corn silage with increased NDF and starch content, but no change in forage yield, Milk per Acre or Milk per Ton. Environments where drought stress extends into grain filling, produced corn silage with lower starch content, 18 to 46% lower forage yield, 24 to 50% lower Milk per Acre, but only 3 to 8% lower Milk per Ton. Plant height is reduced in both of these environments. Success of pollination influences grain and silage yield, the proportion of grain in silage, but little impact is measured on silage quality.